Arctic Fox Pokie Review - Play Today! 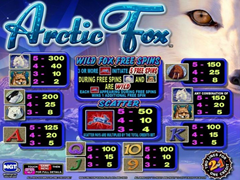 The Arctic Fox is an online slot machine packed with a lot of action. Every time you start playing this slot machine, you get the opportunity to get a piece of the action and each spin should bring you the joy and happiness you are looking for at a slot machine. In case you are wondering what should offer you the best payouts, well you should leave that to the special features. You just have to get 3 bonus symbols on the reels and you can win this way a pack of 5 free spins. There is also another bonus symbol that can offer you free spins and this way you can get a higher chances of seeing your bankroll go up. Wild Fox is a slot machine provided by International Game Technology, one of the most popular slot developers in United States. The game is based on different wild animals that can be found in the arctic wilderness. 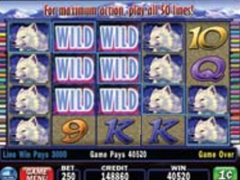 While playing Wild Fox slot machine you should get the opportunity to encounter the special symbols that can bring nice payouts. Some interesting facts about Arctic Fox is that you get the opportunity to find a nice payback percentage that is situated between 85.5% and 98%. The maximum number of credits you can bet for each spin is 500 credits. Another interesting percentage is that while playing the Arctic Fox, you have the opportunity to get the base game hit frequency with the maximum pay lines played of 44%. This is a lot higher compared to many slot games out there, including those created by IGT. The Arctic Fox logo for example acts like a wild symbol and it will be transformed automatically into the symbols that you need to have a winning combination. There is also the rabbit symbol which is acting as a scatter symbol and if you get at least three of them on the reels then you should be able to enable a free spins round. Another thing that should increase the payouts you’re seeing is the stacked wilds. These are the ones that should keep on bringing the type of payout that should keep you on playing this game over and again. The graphics of this video slot game are great and once you start playing it you will want to get a good piece of the action. Both the graphics and the sound effects are realistic and they can create a nice atmosphere that is unique and can’t be found anywhere else. Overall the Arctic Fox is a game that can be appealing to players for many levels. You can find 5 reels and the maximum number of pay lines you can activate goes up to 50. There are several other features available that should be able to bring you the opportunity to get exactly the type of gambling experience an active slot player is looking for.